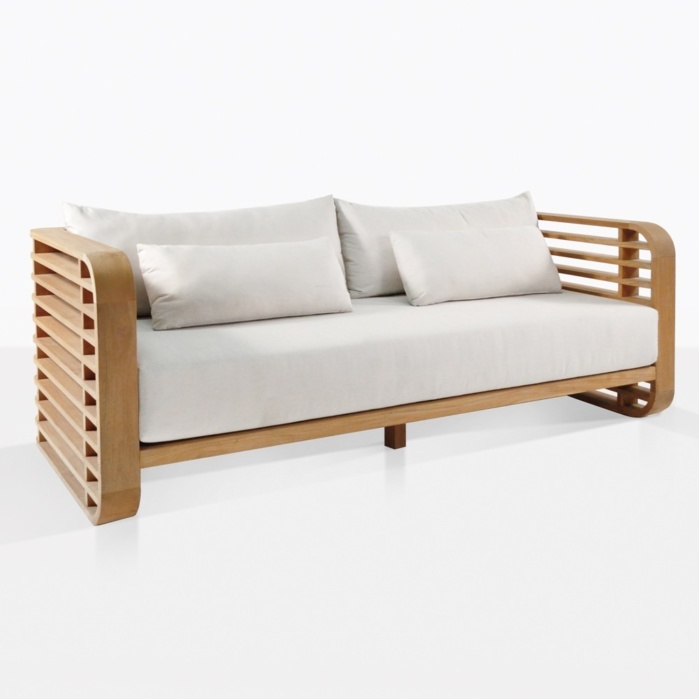 The Teak Outdoor Sofa in the Ocean collection is a truly substantial piece of furniture. It’s made using a large amount of Grade-A teak with a stacked pattern that gives a nautical and open-air feel to the piece. 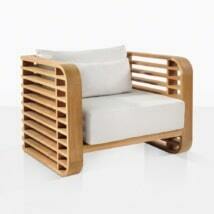 It’s an approachable seating piece that has design elements that just seem to flow so smoothly. W81" x D35" x H30"
The 2 inch spacing between the 4 inch wide teak wood boards shows wonderfully deep lines on the vertical surfaces. The wide deep seating area of this teak outdoor sofa was built for relaxation. It’s got a clean and inviting feel with its open architecture and the attention to design detail. The cushions (as with all Teak Warehouse deep seating cushions) are included without an additional charge. You’ll also notice the symmetry as you move around it to enjoy the way it looks. It’s the type of furniture you just want to run your fingers down as you walk past it. Nine pieces of Grade-A teak laid flat with 2 inch risers separating each piece combine inside a rounded outer frame to really put the wood at the center of the show. 17 inches from floor to top of cushion makes this piece, a sofa that you won’t soon want to get up from. The looks of this piece will work for so many spaces, and the only real requirement for this sleek sofa is that you put it somewhere you plan on spending a lot of time. 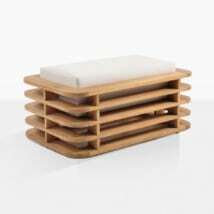 The support is from the heavy robust wood structure. The comfort is from the two wide back support cushions and two additional pillows as well as the 9-inch thick one-piece seating cushion. Sunbrella® fabric on the cushions ensures this is a long-lasting and comfortable Teak Outdoor Sofa.